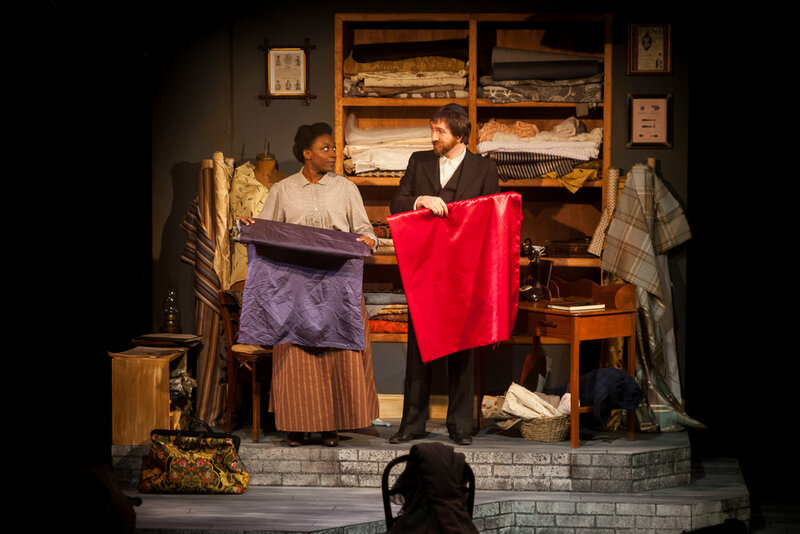 Intimate Apparel, by two-time Pulitzer-winning playwright Lynn Nottage, is a well-meaning play that's a bit unsatisfyingly stodgy. It plays to soap opera expectations about the tricky course of love, even as it strives to make more of the familiar types that inhabit its world. Its humor is low-key and its evocation of behaviors that might be deemed taboo rather tame. Nottage restricts her tone to the borderline gentility of a working African-American woman just after the turn of the century in lower Manhattan. The drama plays close to plausible reality, even as Nottage’s situations gesture, here and there, to more contemporary views of romance and empowerment. Esther, played by Darlene Hope with winning simplicity, is plain-spoken and plain-looking, with talented hands as a seamstress and designer of clothes, and a vision of herself as the future owner of a beauty parlor. Her tribulations stem from loneliness and the dream of a man to share her life. George Armstrong (Beethovan Oden) is a wild card from out of nowhere. A worker on the Panama Canal who hears of Esther through a fellow worker who had been a congregant at Esther’s church, George addresses himself to Esther through letters for the entire first Act. He seems a steady man looking for a church-going woman stateside, but is he sincere? As directed by Dawn Loveland Navarro at Playhouse on Park, the play’s episodic structure—the two Acts are comprised of scenes each named after an article of clothing—becomes more problematic due to the production’s drawn-out pacing. There’s a lot of putting on and off of clothes and that tends to slow things down, as does the spread-out staging. We follow Esther through a series of interactions with a small-town’s worth of acquaintances, moving from one setting to another: the room in the boarding-house that she rents from Mrs. Dickson (Xenia Gray); the boudoir of the upper-class white woman, Mrs. Van Buren (Anna Laura Strider), who buys stylish corsets Esther custom-makes; the piano lounge of a prostitute, Mayme (Zuri Eshun), who also buys lingerie Esther designs; and the fabric shop of an Orthodox Jew, Mr. Marks (Ben MacLaughlin). Esther, played with a shy savvy that makes her an interesting and interested interlocutor, brings a certain level of pining to each space and meets with persons who are generally more experienced, or refined, or opinionated, or established. As with a Chekhov play, there’s a lot of time spent establishing the tone and outlook of each character, if only so that there can be a plot development on each front in Act Two, after George in the flesh ceases to be a romantic fantasy and Esther must cope with a role that gives her more grief than status or satisfaction. The play is better in Act Two if only because Esther starts to have misgivings and regrets and even finds herself to be a romantic interest on more than one front and in a triangle on another. Nottage plays with the plotting of sentimental fiction, where any character introduced is either a romantic interest or a rival to the heroine, and there’s a certain amount of wry awareness to make that work. Yet Esther’s reactions tend to be all-too predictable, even if we share her viewpoint enough to accept them as—to use a word with a certain relevance, both as dated expression and thematic pun—“fitting.” We might find ourselves wishing that Esther would expressly not don a corset in an effort to spark the lukewarm ardor of her husband, or that she might step across lines of class, race, and hetero-normativity to fire it up with Mrs. Van Buren, but such acts would be even more unlikely than some of the things that do happen here. The facet of the play that must maintain our engagement is the meandering arc of Esther’s sentimental education. We might like to imagine what a high caliber cast would do with these roles—which all call for a kind of consummate character-acting that isn’t so easily achieved. At Playhouse, certain key elements seem lacking. As Mr. Marks, Ben MacLaughlin seems more like a fond shop assistant rather than a man who might be of interest to Esther. There’s little to make us feel the gravitas of an attraction to or from Esther. Her interest in him seems to stem from the fact that Marks, who has a prospective arranged bride he has never seen, is the only sympathetic man in Esther’s environs (Manhattan is a rather sparsely populated area, apparently). As the other lonely character who might find a soul-mate in Esther, Mrs. Van Buren is a typical desperate housewife, wineglass in hand, and it’s unlikely anyone will find her very sympathetic. As Mrs. Dickson, Xenia Gray has a certain cheery, if nosy, wisdom, but her disbelief in the dream version of George falls, of course, on deaf ears. As the prostitute who could’ve been a pianist or at least a showgirl, Zuri Eshun plays well to type: she’s forthright, unromantic, genuinely fond of Esther and able to toss out lines about not being on speaking terms with God. Through no fault of her own—other than her beauty and availability—she comes between Esther and George. In having to run a gamut from fantasy figure, to awkward reality, to surly heel, Beethovan Oden underplays the unpleasantness of George, which helps us accept one of the more subtle ambiguities of Nottage’s script. George might be a mean-spirited opportunist, but he might also simply be the kind of man of his time who sees a woman as a means to an end. It’s to the play’s credit that George’s failings, immense from Esther’s view, are not such a big deal in his view of his self-interest. And the tension between his world and our contemporary sensibility helps us find in Esther an inspiring resilience, even if the compromises and dreams and temptations she foregoes seem, as drama, a bit pro forma.